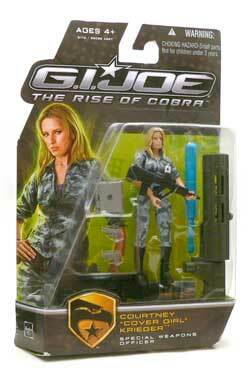 I know there are a number of varying opinions on the GI Joe: The Rise of Cobra. Love it or hate it, it hasn’t hurt the property. If anything else it helped get the “Pursuit of Cobra” line to stores, and I’ve seen lots of great things coming there this year. 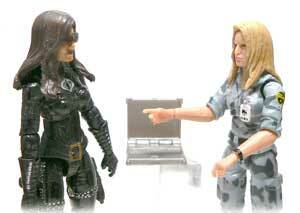 The one thing that I loved about the film is the one thing that I thought took away “GI Joe” mystique. That thing is the uniforms. Where is the animated Joe team wore outfits as diverse as the the team members backgrounds, the movie version of the team wore, well, uniforms. Sadly, I think this made some of the characters a little less recognizable than the others. One of these casualties was Cover Girl. 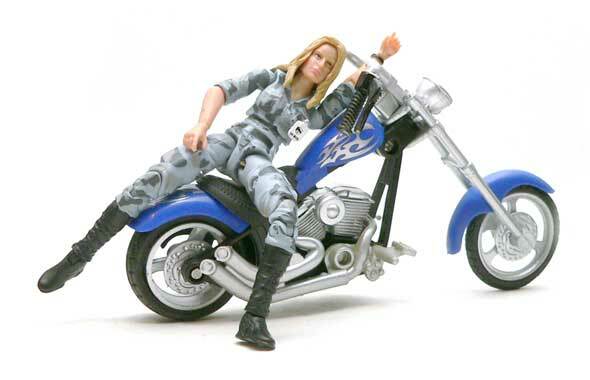 Cover Girl was originally a heavy weapons specialist that drove the “Wolverine” vehicle. In the film, she has basically been demoted to General Hawk’s clerk. Even though I got her on clearance, thought she was ugly in the package, I was impressed with her in the end. 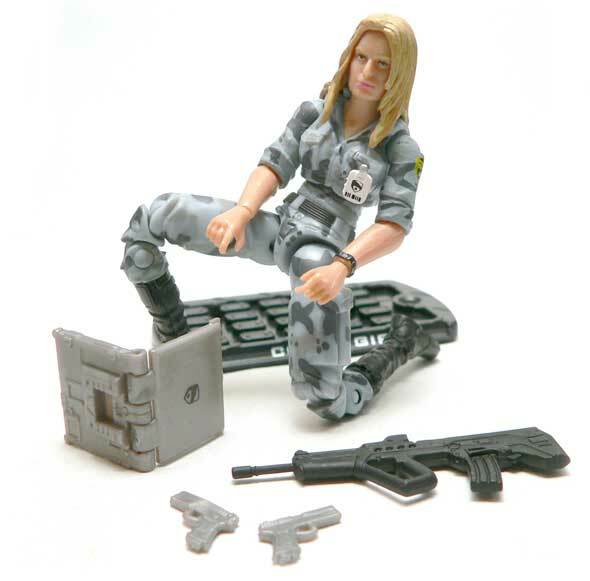 She is pretty good representation of a standard modernish female soldier. The grey urban camo seems to be the standard for this line. Her outfit is simple BDU’s. Pants and a shirt. Quite a step down for a runway model. However, the tall boots she’s wearing are a bit more fashionable than the combat boots that I grew up with. One simple addition to this ensemble could have made this character instantly identifiable as Cover Girl. Her leather jacket. The one thing everybody remembers about the vintage version is her bomber jacket. It would have fit right in. It would have even matched Hawk’s. Have you ever seen the Seinfeld where Jerry’s girlfriend looks different every time he sees her? (I think it is the Festivus/Kramer on Strike episode) That is what this figure’s face reminds me of. When I saw her in the package, I was less than impressed. I got her out of the blister, and she looked a lot better. Then I started taking pictures, and it got worse again. I really think there are some good angles for the face. I think the main issue is the hair doesn’t compliment them all. The hair is a separate piece, and it’s almost like maybe it they were completely designed together. I think CG’s forehead looks a little big, and I really think if her hair would have came down in the front a bit, it would have helped quite a bit. The other thing the hair does is limit the motion of her head. I think it gives her a slightly downward gaze, and that is another reason all of the angle of her don’t quite work. There are three details that I think work pretty well on this gal. The first is the Joe team patch on the left shoulder. It’s nicely done, and looks just like it should. The second is the watch on her left hand. It does a decent job of covering up the wrist joint and would be something she would need in her job. From the side the badge is another store. It is molded from a flesh tone and painted white. It also seems to be extruded as a block from her, uh, breast. It’s small and most people probably won’t notice, I just picked up on it when I was taking the pictures. You would expect a Heavy Weapon Specialist to have, well heavy weapons. And they seem to be lacking here. She does have some weapons. There is a one of the modern rifles we’ve seen with other figures. It’s okay. But, she really can’t hold it well. Next up are two small automatic pistols. They are a bit smaller than the .45 I recently got with a different figure. Molded in grey, they actually look pretty good. The thing that is missing are the holsters. She doesn’t have anywhere to put any of these guns. The accessory I was most interested in? Her laptop. It’s molded in silver and has a Joe logo on the top. There’s an odd indent on the bottom. I suspect that the thing plugs into a playset or vehicle somewhere. If I’d have paid full price for Cover Girl, I’d have been disappointed. However, at the clearance price that I paid for her ($3), she’s not half bad. 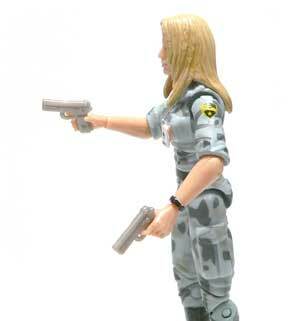 A nice generic female Joe Team member that would look great in a larger display. She’d also make a nice base for a number of custom figures. Yes, the laptop connects to a gun emplacement like the one that comes with Breaker (who also comes with the same laptop), or Lt. Stone, the brief cameo from Brendan Fraser in the movie. Overall, not a bad figure, and it is somewhat refreshing that not all female figures in this scale have the same generic brand of pretty, but the hair is horrid and looks like cheese spaghetti. I actually picked her over Scarlet (Camo) because I thought the hair looked better. It actually looks better in hand to me. But, it’s like I was saying, it varies every time I look at her. Yup. I forgot something. CG also comes with one of those large projectile firing things. This one looks like it might fit on something, it’s got a peg looking thing on the bottom. Ironically, it has a small fold out handle I didn’t see until I wrote this.